Where in the world is Rioja? Rioja is a vast region of Spain, and one of the most well known wine regions from that country. While you can make similarities to Sonoma County, as La Rioja is also a community (or county), the wines from that area can be from Rioja Alta, Rioja Alavesa, Rioja Baja, and even the surrounding regions of Navarra and Alava. Located in a north east pocket of Spain, Rioja can be mountainous, lush, dry, desert, or anything in between. First recognized as a wine growing region in the middle ages, it has evolved to be a world renowned and diverse wine region. The three regions within La Rioja are microclimates, each with specific soil types and terroirs that differ, while holding a similar continental climate. Rioja Alta, where I spent most of my visit, is on the western edge and has the highest elevation. Known for old world style wine, the higher elevation makes a cooler climate. Rioja Alavesa is similar to Rioja Alta, but tends to make bigger, bolder wines. Poorer soil quality means that vines have to struggle more, producing stronger wines. Finally, Rioja Baja is less of a continental climate are more of the warm, balmy, Mediterranean climate. The most common varietal planted in Rioja is Tempranillo, though Garnacha (Grenache), Graciano, and Mazuelo (Carignane) are alos allowed and are commonly used for blending. There are a few rebel wineries that are doing some single varietal bottlings of these grapes and are really very interesting. While they are the same grapes as their French neighbors in the Rhone valley, they are quite different and more powerful. The more rare and special Rioja Blancas are usually Viura (Macabeo, which is often used or Cava), Malvasia, and my favorite – Garnacha Blanca. One of the keys to understanding Rioja, beyond the sub regions, is understanding the classification system. Much like Bordeaux and it’s first growth Chateau, Rioja has rules around what can be a Crianza, Reserva, or Gran Rerserva. But it’s not what you think! Spanish wines are labeled based on how long you age the wine; while there is a newer classification that is simploy “Rioja”, or declassified wine, you can classify most wines in three categories. Gran Reserva wines typically appear in above average vintages with the red wines requiring at least 5 years aging, 18 months of which in oak and a minimum of 36 months in the bottle. Gran Reserva whites and rosés must be aged for at least 4 years with at least 6 months in oak. Confused? Yeah me too; so Crianza is what most people drink on a daily basis, and what you’d order in a bar. Reserva is probably what you’d bring to a dinner party or to your parent’s house, while Gran Reserva is what you’d save for a special dinner. Of course the interesting thing is, there are often Crianzas that are better quality than Reservas, as it’s simply a matter of age. Look for the green Rioja label if you want to try wines from the region that don’t play by the rules, and simply needs sto be from La Rioja. Red is for Crianza. Think fun, glass of wine at a bar. With up to 2 years in oak, these are silky and soft, and ready to go. Burgundy is for Reserva. This is a food wine, can have a lot of tannin and works with food. Purple is for Gran Reserva. With 2 years in oak, and another 3 years of bottle age, they can be a bit over powering and benefit from a good swirl in your Soiree or Vinturi. Of course the rules for white wine and rosado vary but these are the basics. And now that you know, go out and find some Rioja for dinner tonight! Rioja is not a vast region of Spain, is a little region of spain. The same name is for three things: the geographical region, who includes part of Burgos, Alava and Navarra; the state (comunidad autonoma); and the region of wine, who is the smallest of three. When you talk about wine region you must say "Rioja", but when you talk about the geographical region or the state, you must say "La Rioja (the rioja)" I'm in La Rioja is the correct form, not "I'm in Rioja"- Rioja is only the name for the wine region. 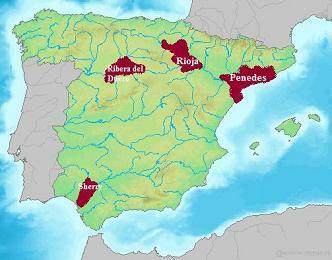 For the geographical zone and the state, the correct name is La Rioja. Gran artículo, y muy bien explicado. En nuestro sitio web de asesoria vitoria tenemos un completo dossier sobre la relación histórica que, gracias al vino de Rioja, han tenido las vecinas ciudades de Vitoria y Haro. Great article. You explain very well the situation of Rioja, and the three zones of wine. In our web, asesoria vitoria, we have a complete dossier about the historical relation beetwen Vitoria and Haro, capitol of Rioja wines.